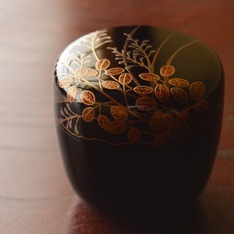 Maki-e is a distinctively Japanese Urushi work technique that is said to have developed around 1,200 years ago. 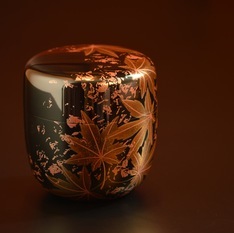 It involves using a fine brush to paint a picture with Urushi on the surface of a vessel, and then sprinkling gold powder on the surface before the Urushi dries to create a design. The word maki means to sprinkle and e means picture. 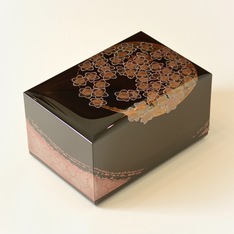 There are various styles including togidashi maki-e, hira maki-e, and taka maki-e.
As many as 400 years ago, large amounts of Japanese maki-e were exported to Europe and other destinations, and the Japanese word maki-e is known overseas as well. 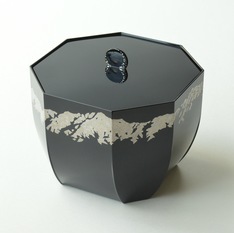 Maki-e is a splendid technique of creating designs with gold or silver powder atop a lacquer background, and is used in conjunction with other techniques such as raden (decorative seashell work), gold and silver inlay, and eggshell Urushi. 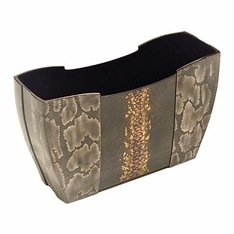 (4) Burnish it with powdered deer antler, and it's complete!